Also known as, your new favorite quick dinner in 2017! New year, new you and burrata in your omelet. If you haven’t tried burrata with your eggs yet, you are totally missing out. I chose eggs as my first shared dish of 2017 because they are probably my favorite food. Definitely my most consumed food. I love ‘em every which way (except runny when scrambled, because GROSS) and have them every day – and I love the yolks and whites equally! I don’t discriminate. But you could do a few less yolks or a few more whites since it’s January and, well… you know. Whomp whomp. I also like to throw a handful of spinach in the center of my omelet because it’s just so simple. It’s an easy way for me to eat vegetables without thinking about it. The spinach steams and is covered in a blanket of cheesy burrata, so why WOULDN’T I eat it? Also! Point to note. This omelet serves two. I mean, I guess it could serve one if you were super hungry/hungover. 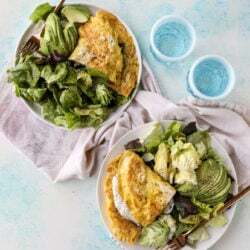 But I like to make this omelet for two for dinner and serve it with butter lettuce and avocado. I loooooove butter lettuce and avocado paired together like whoa. It’s so soft! And… buttery. Breakfast for dinner is a go-to in our house once a week. It’s the thing we make when we have no idea what else to have but don’t want to order out. And this meal is ridiculously filling. Sometimes I have it for breakfast too, but that’s only when I can get my act together, which is precisely never. Heat a large skillet over low heat. Add the coconut oil. Make sure it melts all over the entire pan. Add the eggs and swirl the pan until the eggs cover the bottom. Let the eggs cook, untouched, for a few minutes until set – I like to tilt the pan so the egg in the center runs around the outside edges and cooks, and sometimes I even lift up the edges so the egg runs underneath. This allows the whole omelet to cook without flipping! Once the eggs are almost set. Place a handful of spinach on top and then the burrata. I pull the burrata apart so it’s melty and delicious over the center, because I’m going to cut this omelet in half when serving. After a minute, fold the omelet in half gently. You can briefly cover it, or just continue to cook until the cheese is melty and the spinach is wilting inside. I remove the omelet from the heat and let it sit for a minute before slicing it in half. See? This is so much better than a smoothie. 18 Weeks of Menu Planning! 126 Lightened Up Meals for 2017. Oh, crazy yumness! This is so my kinda salad and I love how it can go breakfast, lunch, or dinner! 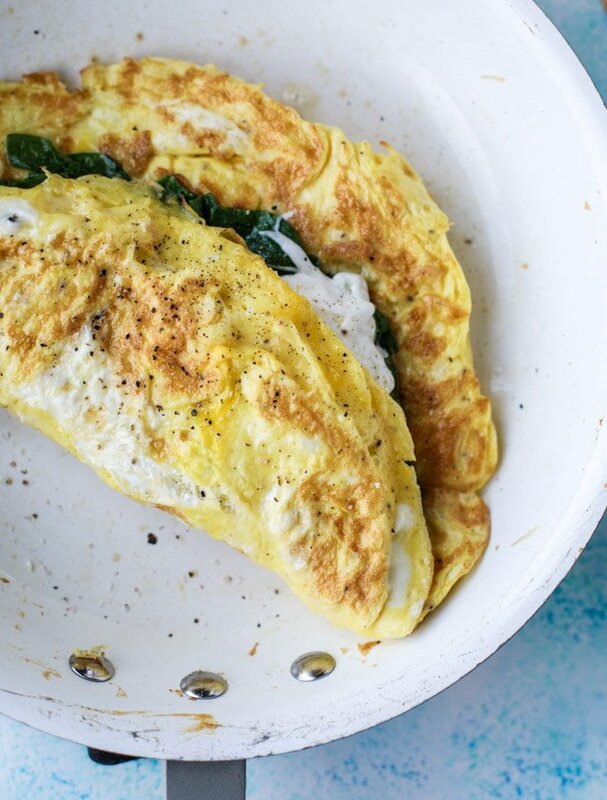 This is perfection..burrata in an omelet?! You’re my hero. Love the avo and butter lettuce combo too! 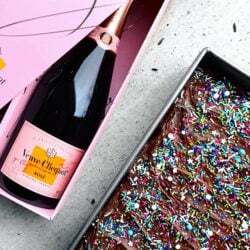 I just listened to your interview with Nicole Culver on Blissful Bites- I love you even more now! So glad I found your blog ???? So delicious! Love the burrata in there! This could work, it might work, it should work…..alas my husband puts ketchup on any egg dish I make. So I stopped making omelets. So lunch for me it is! Everything I love, wrapped up in one dish! can’t wait to make it. Burrata with eggs is something new. This is going on my breakfast table very soon. Happy New Year!! Breakfast for dinner is now officially a thing in this house! Thanks for the inspiration!! Oh gosh. This looks SO yummy. I think I need to buy a smaller pan for my omelettes. Our giant fyring pan always leaves them too thin, unless you use like 12 eggs! i find mine at my local grocery store, near the parmesan and italian cheeses! I finally got to try burrata at the Nordstroms cafe at Ross Park. It is so good! I am having trouble finding it in the stores. Any recommendation on where to look? I love eggs for dinner, too! The easiest thing ever. This looks like a fancy version of my usual thanks to the addition of burrata! How I lived without that cheese for so long I have no idea. Can’t wait to put it all together just like those pics! Thanks for the inspiration! I KNOW. it’s the best! thanks danielle! YUM! This appeals to my avocado obsessed, protein-craving, vegetarian self on SO many levels. Can’t wait to try it. Tried this recipe tonight and it is AWESOME! What a great way to make eggs! I didn’t have burrata cheese so purchased fresh mozzarella. YUM! !